Since discovering Rebecca Dean very recently, I’ve been reading her novels at a rate of knots. 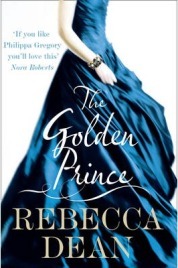 The first two which I read, Enemies of the Heart and The Palace Circle, were about fictional characters in a historical setting, but The Golden Prince is a departure from that formula. While it does feature fictional characters, it also takes a very prominent historical figure and places him at the centre of the story. The Golden Prince of the title is Prince Edward, Prince of Wales and heir to the throne, son of King George V. He is remembered as King Edward VIII, the king who abdicated in order to marry Wallis Simpson. The Golden Prince is concerned with his earlier life however, beginning when he is a teenage naval cadet at Dartmouth. 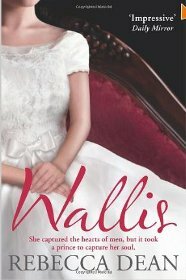 Wallis by Rebecca Dean is a novelisation of the life of Wallis Simpson, from her childhood to the beginning of her affair with Prince Edward, later Edward VIII. Born Bessiewallis Warfield in Baltimore, Wallis had been divorced once already and was married for the second time when she met Edward. His later decision to abdicate in order to marry her cut him off from his family. Wallis’s early life was not an easy one. Her father died when she was very young, and her mother struggled to make ends meet, as his family was not keen to help her out, although they did pay for Wallis’s education. Her first husband, Win Spencer, was in the navy, but it was not a happy marriage and ended in separation followed by divorce. 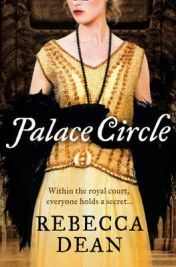 Having read and loved Rebecca Dean’s Enemies of the Heart, I was keen to read more of her novels – and chose Palace Circle as the next one I would read. It opens in Virginia, where eighteen year old Delia has just married Viscount Ivor Conisborough, over twenty years her senior and a member of the British aristocracy. At first she loves her new life in London, where she meets people such as Winston Churchill and Wallis Simpson, but she soon discovers there are secrets in her and Ivor’s life. Palace Circle covers both world wars, and later includes Delia’s daughters, Petra and Davina, as narrators. The family moves to Cairo where Ivor is appointed as an advisor to King Fuad, and this is where much of the action is focussed during the Second World War. As a long-time fan of Penny Vincenzi, when I was looking for an indulgent and absorbing read during the recent bank holiday weekend, I searched for authors like her – and one suggestion which came up was Enemies of the Heart by Rebecca Dean. Liking the description of it, I immediately downloaded the novel to my Kindle and got stuck in. 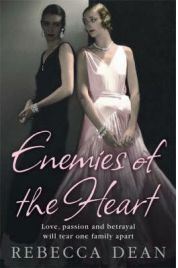 Enemies of the Heart opens in 1909, when cousins Zelda and Vicky are visiting Berlin. American Zelda has her eye on Josef Remer, heir to the immense House of Remer steelworks and fortune, while quieter Vicky falls for the shyer Berthold Remer. When war breaks out in 1914 though, the family is pulled apart and loyalties are tested.